SPRING participated in a week-long partners’ planning meeting for the study entitled: “Community-driven and digital technology-enabled agriculture intervention for nutrition: a cluster randomized controlled trial in Odisha, India.” The study is funded by the Bill and Melinda Gates Foundation (BMGF), led by the London School of Hygiene and Tropical Medicine (LSHTM), and includes partners: Digital Green (DG), Voluntary Association for Rural Reconstruction and Appropriate Technology (VARRAT), Ekjut, Development Corner (DCOR), and SPRING. The meeting included a nutrition-sensitive agriculture orientation and a field visit to Jharkhand. Over the course of its visit, SPRING was also invited to participate in a half-day project launch of a USAID-funded project, Digital Platforms to Scale Gender-Sensitive Nutrition Social and Behavior Change, hosted by the Jharkhand Nutrition Mission and Digital Green, where SPRING presented its experience integrating nutrition Social and Behavior Change Communication (SBCC) into Digital Green’s human-mediated video platform. Victor Pinga, SPRING Agriculture Advisor, and Ashley Aakesson, SPRING SBCC Advisor, feature the SPRING linking agriculture-to-nutrition pathways as they lead an interactive session to orient partners on nutrition-sensitive agriculture. Victor Pinga, SPRING Agriculture Advisor, facilitates a session on context-specific nutrition-sensitive agriculture interventions. Partner members from LSHTM, DG, VARRAT, Ekjut, DCOR, and SPRING, pose for a photo together. 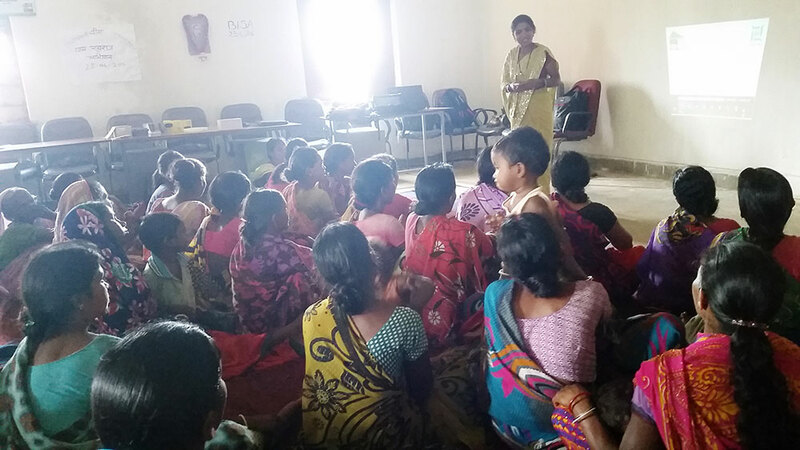 A local livelihood and agriculture extension agent in the Ranchi District of Jharkhand, India, introduces a DG video on seed treatment. 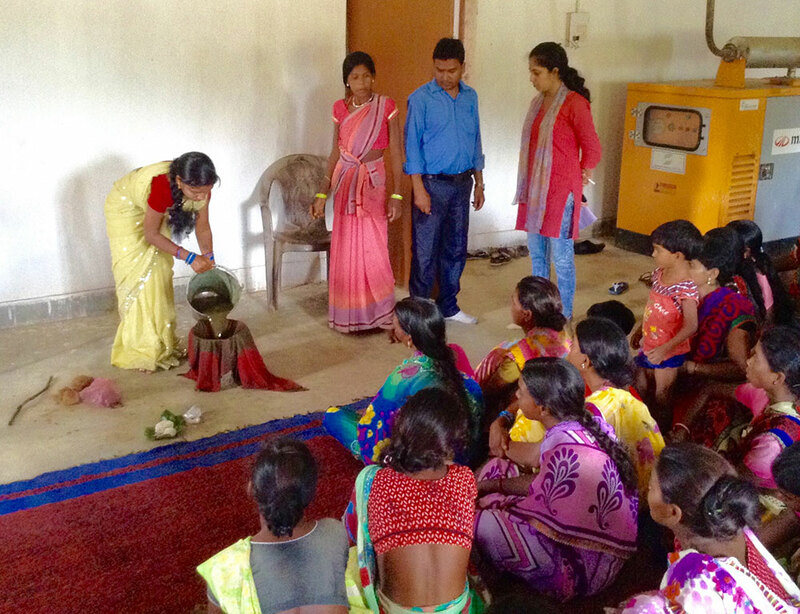 Following the video, the local livelihood and agriculture extension agent conducts a demonstration on seed treatment. 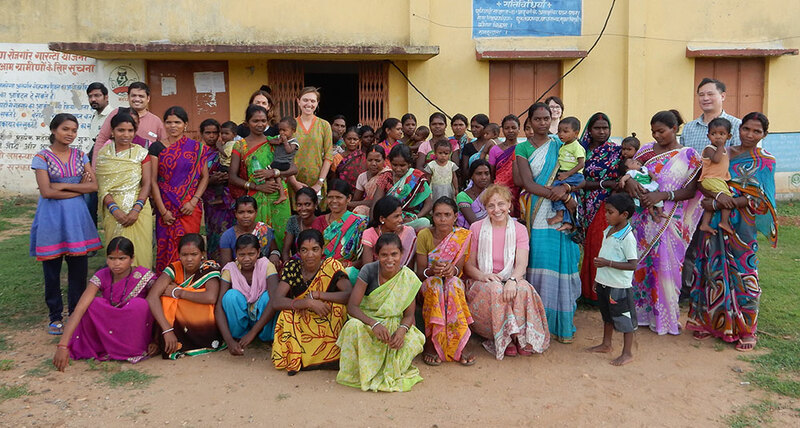 The field visit group in Jharkhand, India. 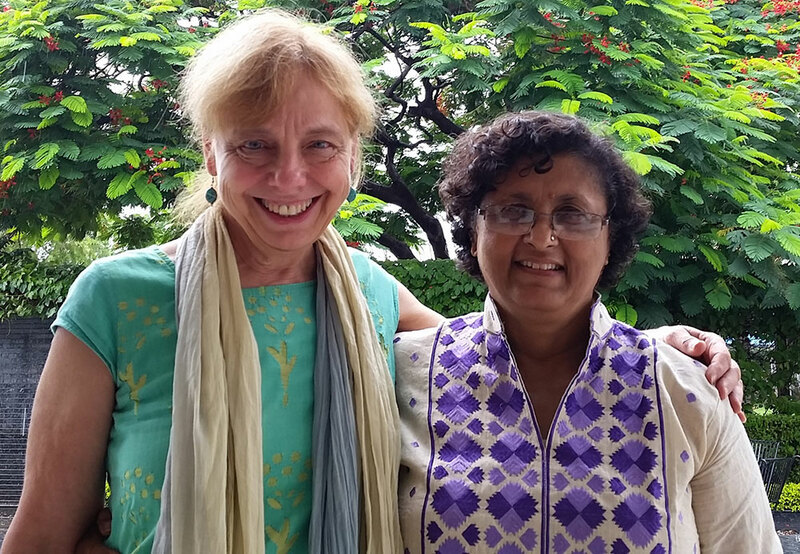 Peggy Koniz-Booher, SPRING Senior Nutrition and SBCC Advisor, meets with the Alive & Thrive representative, Dr. Nagendra Varada in Jharkhand, India. The team participated in a half-day project launch of Digital Platforms to Scale Gender-Sensitive Nutrition: SBCC, hosted by the Jharkhand Nutrition Mission and DG. As part of a panel discussion, Ms. Koniz-Booher presented SPRING’s experience integrating nutrition SBCC into DG’s mediated video platform. 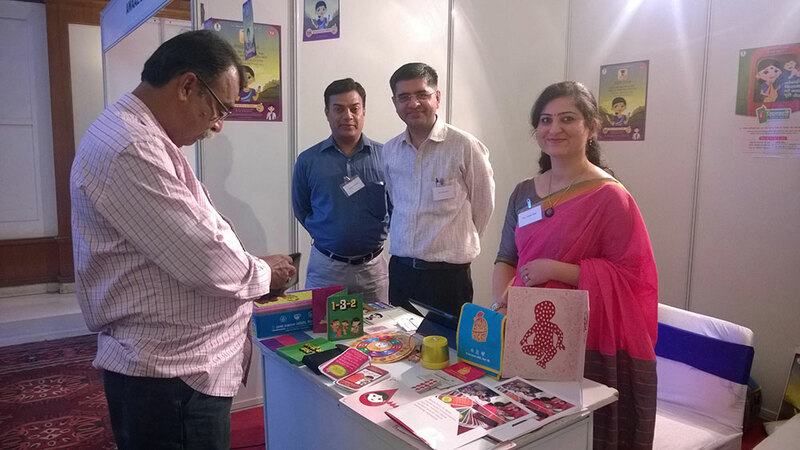 This photo shows the event’s idea marketplace, where experts featured innovations for furthering SBCC within nutrition and gender programming. Peggy Koniz-Booher, SPRING Senior Nutrition and SBCC Advisor, and Dr. Suneetha Kadiyala, Principal Investigator and Senior Lecturer of Nutrition-Sensitive Development at LSHTM, participated in an informal meeting with the Jharkhand State Nutrition Mission to discuss potential future areas of collaboration. Project partners collaborate during the nutrition-sensitive agriculture orientation. 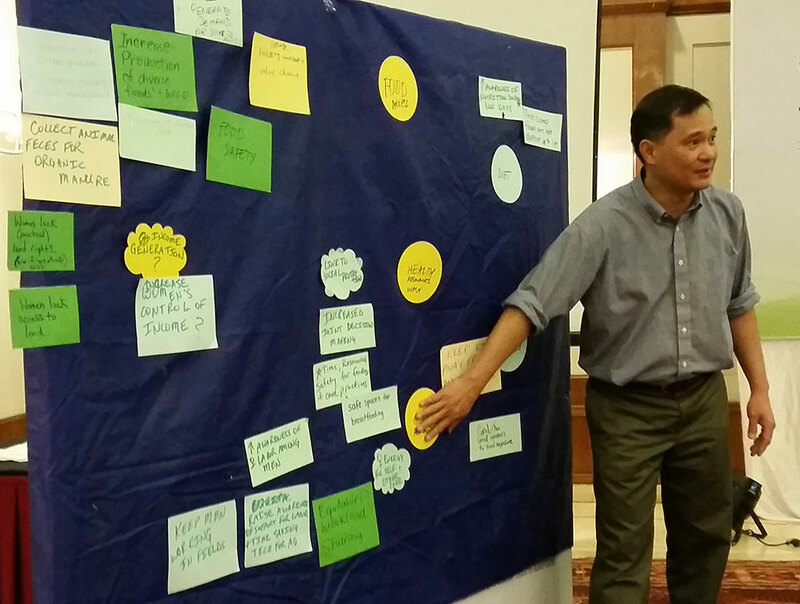 Over the course of the orientation, partners worked toward a common understanding of agriculture-nutrition linkages, a shared definition of nutrition-sensitive agriculture, and developed an operational framework for nutrition-sensitive agriculture to support the planned RCT.